Every year, I tell myself that instead of heading out to the mall, or knocking out half my Christmas wish list on Amazon, I’m going to spend my time making delicious homemade gifts for my family and friends. And every year, I start with good intentions. But truth be told, said gifts never quite materialize under the tree on Christmas Eve, for a variety of reasons. The first reason being that I constantly overestimate the amount of free time I have around the holidays. Sure,even though a day of baking, candy making, and canning sounds delightful and would take care of lots of hard-to-shop-for people, a whole day to commit to being in the kitchen can be few and far between in December. Then there is the second reason: things I make tend to “disappear” long before December 25th. This is especially true of candy, even when hidden in the freezer. Then, there are the myriad of other reasons: I get concerned about people with food allergies, I become anxious about the freshness of coconut macaroons if kept in a decorative tin, etc, etc, etc. Despite the fact that giving food as gifts has so rarely worked out for me in the past, I’m keeping the dream alive this year. It should be my kind of thing, you know? So back a hundred years ago (in, like, October), I saw the recipe for David Lebovitz’s Herb Rub, and I thought to myself, “Self, that would be the perfect thing to make with all of these herbs in my garden!” Since it was starting to get cold, I knew they wouldn’t last much longer, so I needed to use up the huge bunches of rosemary and sage I was bringing inside. And I swear, even back in October, I was thinking that this might be a great thing to give people, packaged in cute little jars, as a Christmas present. So I made it. And it was so good and tasty and easy… that I had to share it right away. So I brought a little to work, I brought a little to my mom, I used a lot of it on pork tenderloin for dinners and in some olive oil as an accompaniment for bread. It works as a kind of all-purpose seasoning: I’ve successfully used it on chicken, pork, and steak. At Thanksgiving, we used some of my mom’s portion to mix into softened butter for the rolls- heavenly. And I haven’t tried it, but I have a sneaking suspicion it would be delicious thrown in some pasta with a little olive oil or tomato sauce. I quickly decided I needed to make more. So I did, immediately. But the thing is… um… I want to keep it for myself. 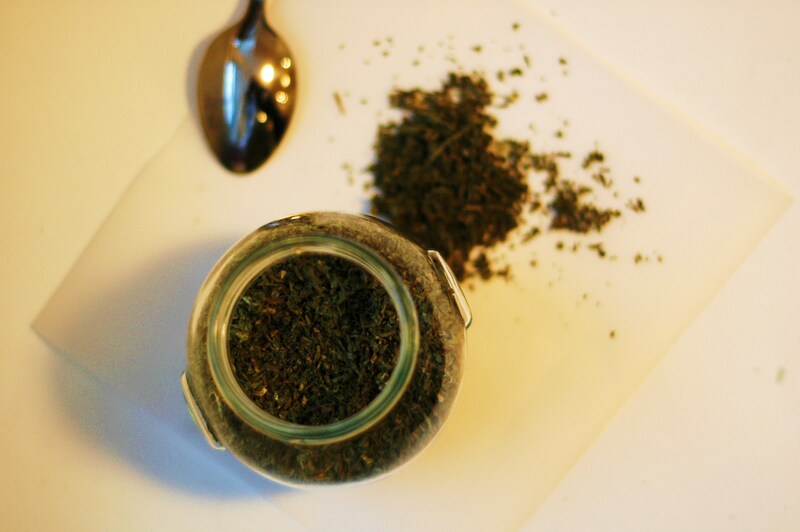 I don’t want to give away my delicious herb rub made from my homegrown herbs. The idea makes me a little defensive, and I’m not quite sure why. I start making up excuses why I can’t give it away in those cute little jars for Christmas presents. 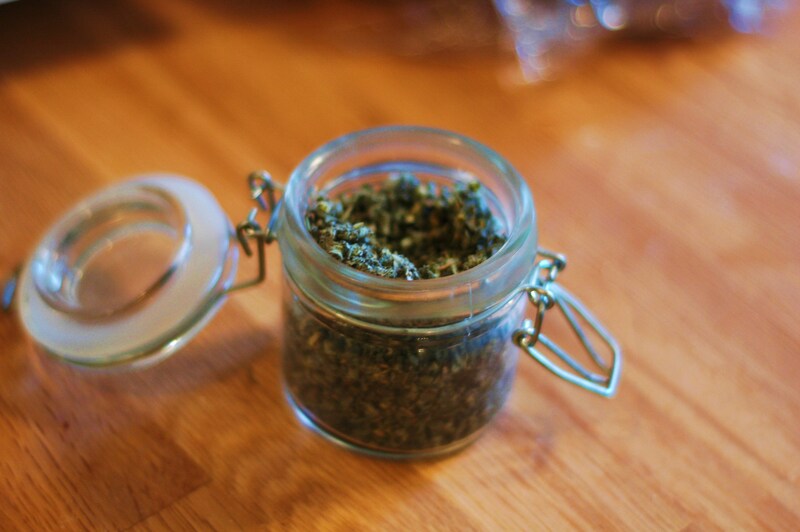 The thought of running out of my own stash halfway between now and my next crop of herbs makes me…upset. And so I’ve closed the door on giving herb rub as a gift for Christmas this year. But the whole point of this silly story is: This herb rub is just that delicious, easy, wonderful. And it’ll keep in a jar in your spice cabinet for a good long while… if you can manage to not use it all up in a matter of a week like I did. Disclaimer: Yes, this does bear a striking resemblance to another, um… herb. This makes it particularly funny when you share with friends and family and hand it over to them in a small plastic bag. Just sayin’. 1. 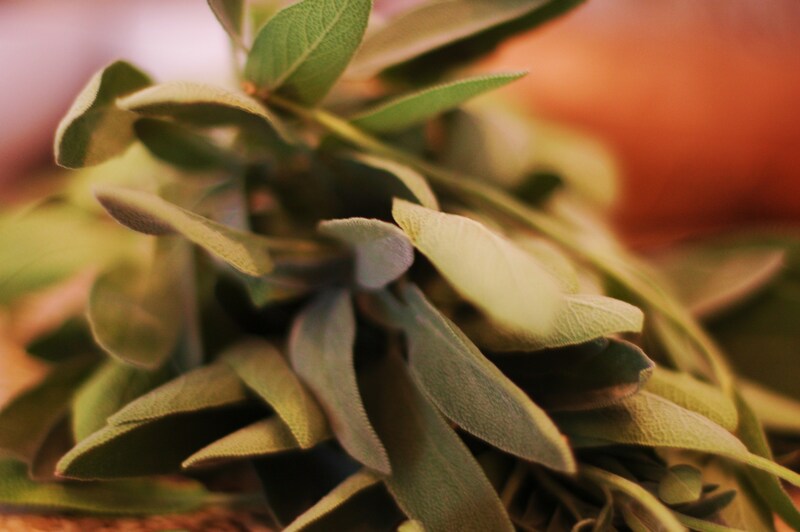 Pick the leaves off the sage and rosemary stalks. 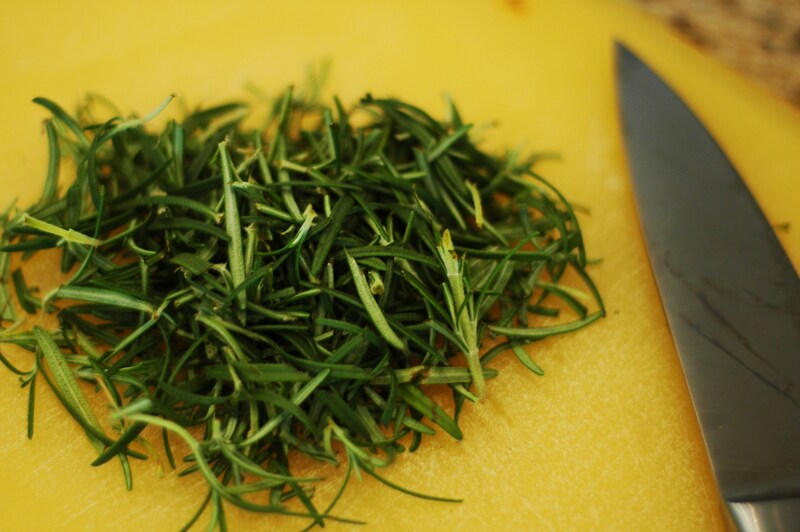 Now, you have two options: either finely chop the herbs and garlic, then mix them all together with the salt, OR, throw everything in a food processor and pulse until everything is finely chopped. It’s good to have options, eh? 2. 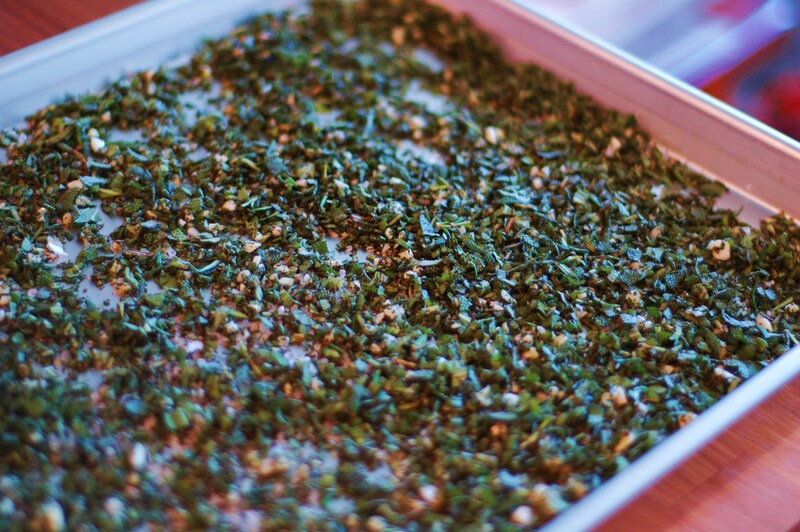 Spread the mixture on a baking sheet and let it dry for about three days, or until completely dried out. 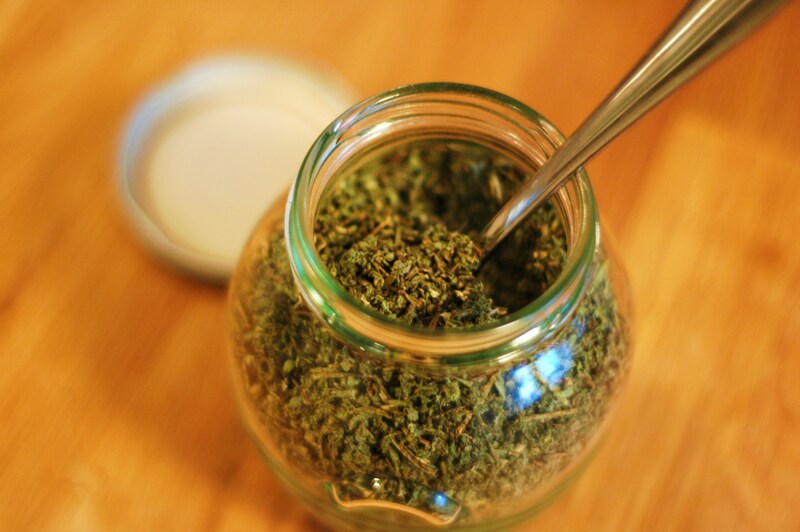 Store in an airtight container, for up to a year.